A man was found shot dead early Tuesday in a Mt. 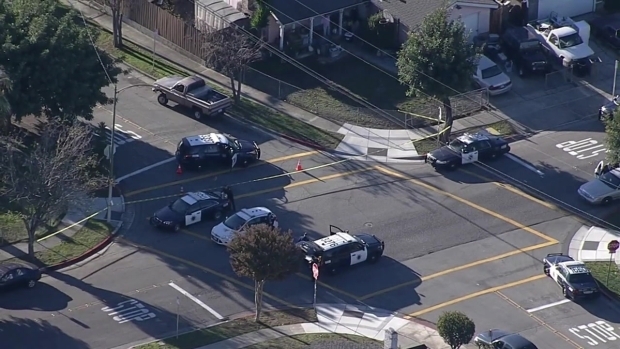 Pleasant High School parking lot, prompting a homicide investigation, San Jose police said. Officers received a call about the body on the 1700 block of South White Road around 7 a.m. Homicide detectives and crime scene investigators combed the East San Jose scene, and went door-to-door, talking to neighbors and looking for witnesses. Yvonne Sawyer said she heard, "Two bangs: Pow! Pow!" She was extremely upset upon learning that a young man had been shot just a few yards from her house. Police said he had at least one gunshot wound. Sawyer described the situation as "scary" and "really upsetting." A man's body was found near Mt. Pleasant High School in San Jose, police said. Superintendent Chris Funk told NBC Bay Area that the grisly discovery was made near the athletic fields on the northeast corner of campus, but does not involve any students or staff members. Some students who saw the body as they headed to class Tuesday morning shared graphic images of the victim with dozens of other students on Snapchat. Rose Vasquez said her two daughters who attend Mt. pleasant High School saw the video. "That had me very worried," she said. "You can't unsee something like that. I saw it and I am still shaken over it." Some parents were upset because school administrators only informed them of a medical emergency. If they had known about the shooting, they would have kept their children home, they said. A school-goer described being afraid because classes went on as usual. "What if the gunman came back?" the student asked. Police are still looking for a suspect and have not yet released the name of the victim, according to spokeswoman Gina Tepoorten. Tuesday's death marks San Jose's 30th homicide of 2017 as compared to 47 at the same time last year, police said. NBC Bay Area's Kris Sanchez contributed to this report.